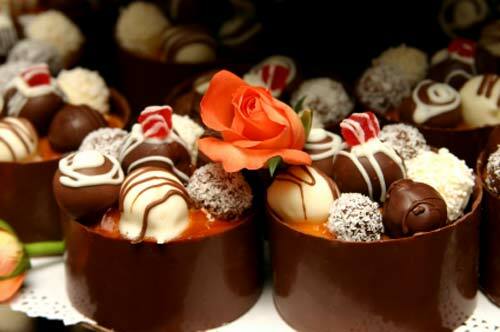 Chocolate wedding cakes are a melt in the mouth experience. What chocolate lover could refuse a slice of one of these perfect wedding cake designs. 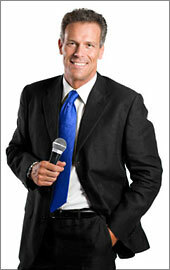 It's no accident you landed on this page. 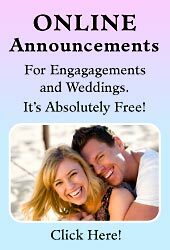 Most wedding couples who choose the traditional chocolate mud cake usually have the cake covered over with a firm smooth white layer of fondant icing, then decorate it with fresh or silk flowers, satin or organza ribbons, cake toppers and other accessories to match the colour scheme or wedding theme. 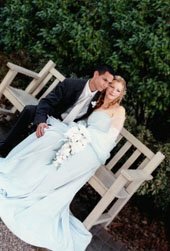 Well some couples go as far as having a brown or chocolate wedding theme! 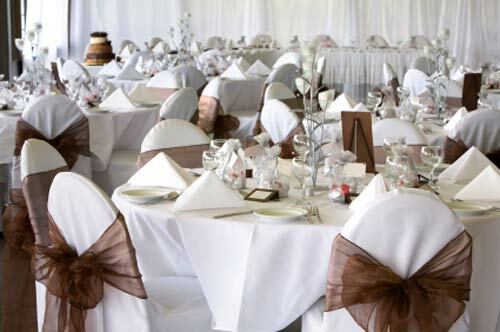 This is where the groom and groomsmen wear chocolate brown coloured ties with classic white rose boutonnieres to match the theme, as well as matching wedding reception decorations like brown organza chair covers. 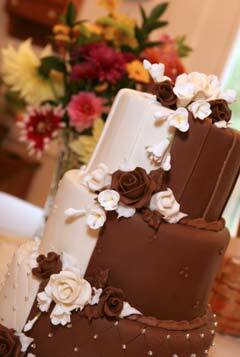 Who would say brown wedding cake designs would look so amazing as a wedding cake. 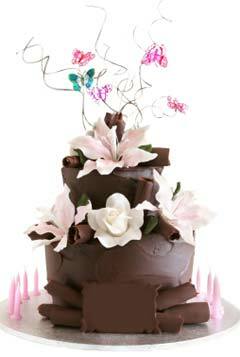 Have a look at these mouth watering modern chocolate wedding cake designs - as I slip a piece of chocolate in my mouth. Oops! I've got some on the keyboard. 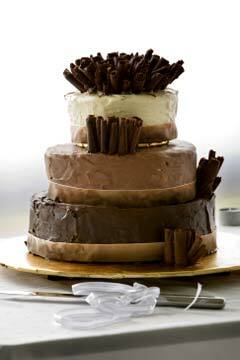 Three tiered chocolate flavoured cake; white, milk and dark chocolate on different tiers. 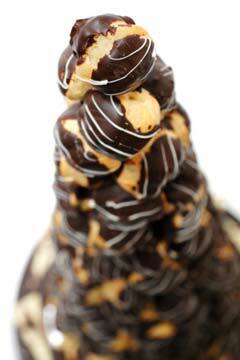 Profiterole wedding cake; hollow pastries typically filled with cream and covered with chocolate sauce. Miniature wedding cake and desserts; these are tiered like wedding cupcakes - full size dessert portions instead of a traditional cake. This lovely cake is split from left to right, having half white chocolate and half dark chocolate on the right side. This unique two tier cake is covered with swirls and chunky slabs of chocolate decorated with pastel pink tiger lillies. 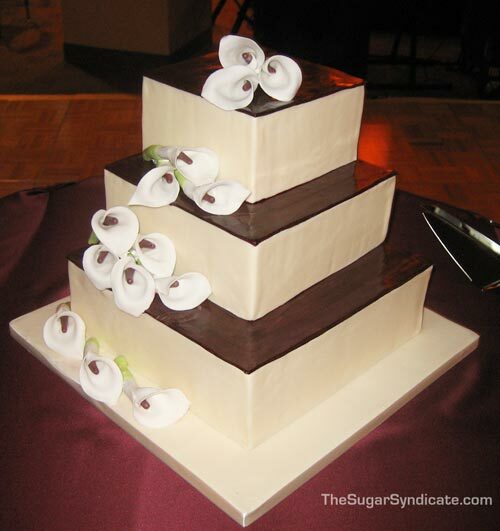 Three tier square chocolate brown wedding cake. 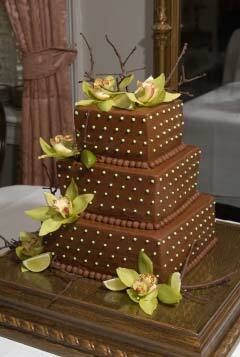 A chocolate covered mud cake is garnished with stunning green cymbidium orchids. This lovely chocolate buttercream cake for those of you that absolutely love creamy cakes. Filled with traditional chocolate ganache filling. To be a little different, adventurous brides are opting for the chocolate look over the white smooth fondant covered wedding cake and having brown as their wedding colour theme. 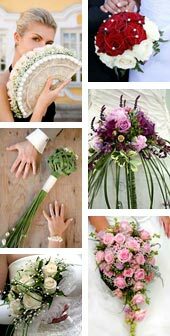 Here's an example of a white and chocolate theme wedding. 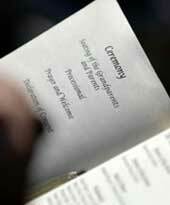 Chocolate brown coloured name cards, menu's and matching organza wedding chair covers. 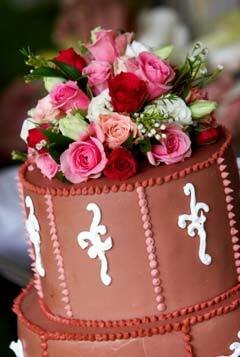 Not to mention an amazing design choice of modern chocolate wedding cakes to suit your style and taste.